Enjoy the outdoors with a family or community several nearby barbeques at the picnic pavilion at Town Hall Terrace. 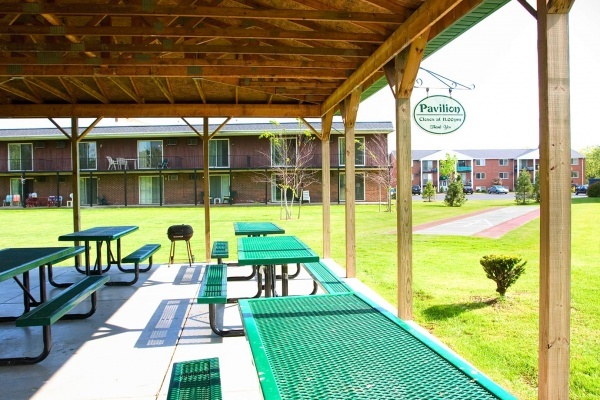 The picnic pavilion is a great place to mingle with friends and enjoy a party as well as meet with other residents. For those new to the area or for those who love to bring their friends and entertain, the picnic pavilion is the go-to location. Town Hall Terrace’s apartments, townhouses and patio homes in Grand Island, NY, are not only comfortable and lavishly adorned inside, but the community also presents a long list of extras for you to enjoy. The picnic pavilion is a quaint, clean social setting surrounded by a wide expanse of green grass where children can play and adults can mingle. Town Hall Terrace hosts regular events at the picnic pavilion where residents can meet, relax and enjoy a sunny afternoon. Picture yourself at the picnic pavilion and come and see the exceptional neighborhood at Town Hall Terrace. Call to schedule a tour of an apartment or townhome and make yourself part of the community.